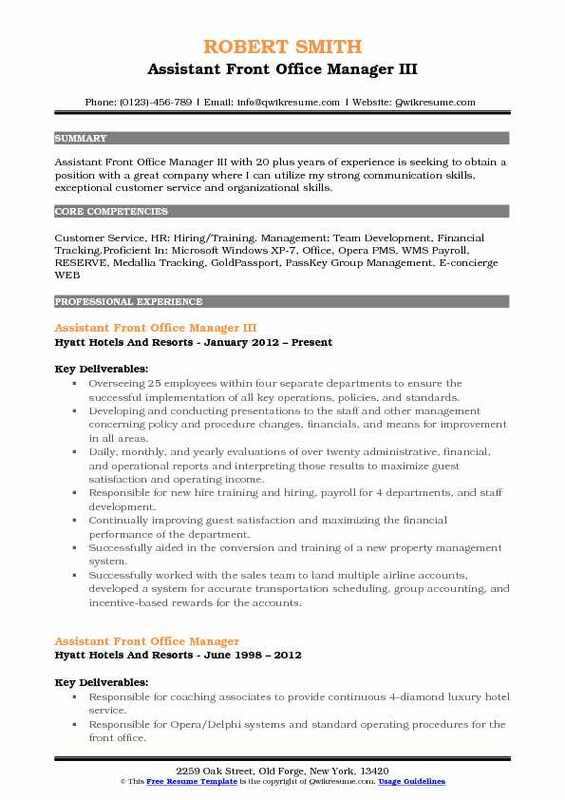 Assistant Front Office Manager assists the Front Office Manager in executing various front office operations. 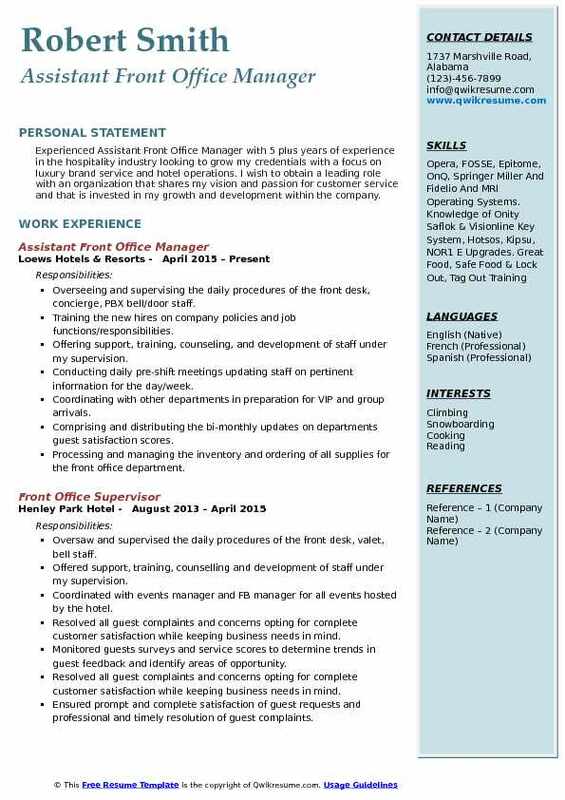 A well elaborated Assistant Front Office Manager Resume depicts job duties that include – supervising front desk personnel, processing payments, inventory and bookkeeping activities: among the other job descriptions, these assistants take charge of addressing guest concerns and providing customer satisfaction, training other staffs, scheduling shifts, monitoring office supplies and stocks, ensuring proper distribution of emails, keeping an updated record of office costs and expenditures. A successful assistant front office manager needs to have strong verbal and written communication, decision –making and coordinating skills. 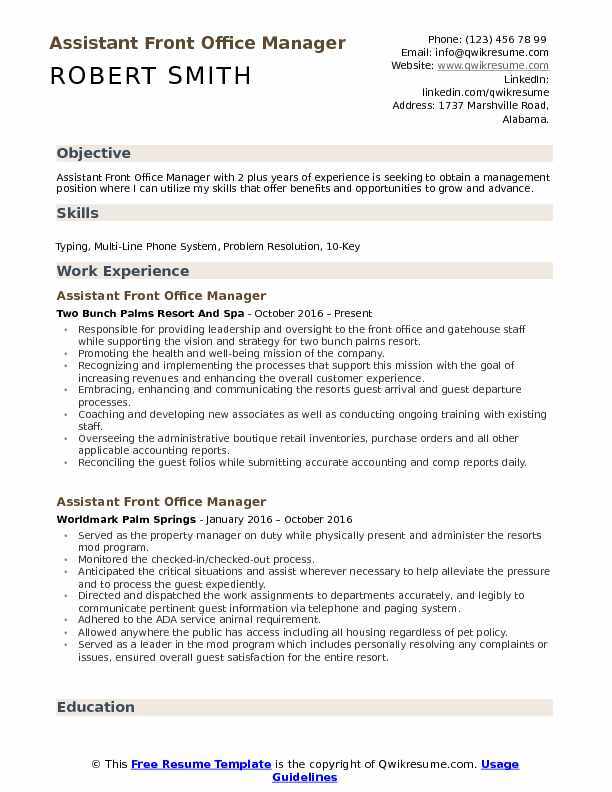 Employers normally want their Assistant front office manager to possess certain core skills like solid knowledge of MS Office, hands-on experience in using office equipment, performance evaluating ability and robust monitoring techniques. Candidates interested in this career must hold a High school diploma, additional certification will be considered as an advantage. 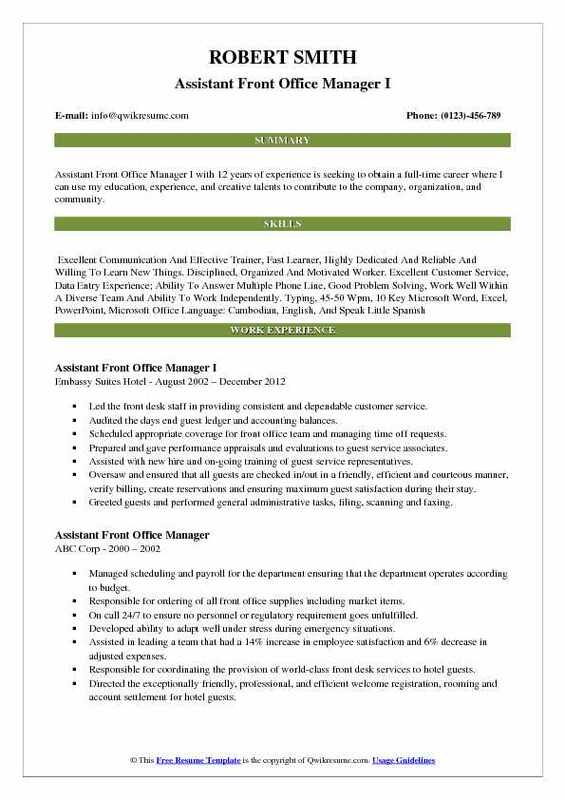 Objective : Assistant Front Office Manager with 2 plus years of experience is seeking to obtain a management position where I can utilize my skills that offer benefits and opportunities to grow and advance. Responsible for providing leadership and oversight to the front office and gatehouse staff while supporting the vision and strategy for two bunch palms resort. Promoting the health and well-being mission of the company. Recognizing and implementing the processes that support this mission with the goal of increasing revenues and enhancing the overall customer experience. Embracing, enhancing and communicating the resorts guest arrival and guest departure processes. Coaching and developing new associates as well as conducting ongoing training with existing staff. Overseeing the administrative boutique retail inventories, purchase orders and all other applicable accounting reports. Reconciling the guest folios while submitting accurate accounting and comp reports daily. Overseeing the night auditing responsibilities to include reconciling daily activity and closing all accounts in preparation for the new day. Summary : Assistant Front Office Manager II with 18 plus years of experience is seeking to obtain a full-time career where I can use my education, experience, and creative talents to contribute to the company, organization, and community. Greeting the guests directing all visitors, vendors, and calls routed to the appropriate department. Leading the front desk staff in providing the consistent and dependable customer. Scheduling the appropriate coverage for front office team and managing time off requests. Assisting with new hire and on-going training of guest service representatives. Responsible for charging no-show and cancellation reservations on daily basis. Overseeing and ensuring that all guests are checked in/out in a friendly, efficient and courteous manner, verify billing, create reservations and ensuring maximum guest satisfaction during their stay. Training front desk staff on how to provide friendly and efficient service to the guests, taking an active interest in the development of subordinates through training and involvement in innovative thinking. Preparing and giving the performance appraisals and evaluations to guest service associates. Ensuring that policies and procedures in regards to staff appearance are being met. Summary : Assistant Front Office Manager I with 12 years of experience is seeking to obtain a full-time career where I can use my education, experience, and creative talents to contribute to the company, organization, and community. Led the front desk staff in providing consistent and dependable customer service. Audited the days end guest ledger and accounting balances. Scheduled appropriate coverage for front office team and managing time off requests. Prepared and gave performance appraisals and evaluations to guest service associates. Assisted with new hire and on-going training of guest service representatives. Oversaw and ensured that all guests are checked in/out in a friendly, efficient and courteous manner, verify billing, create reservations and ensuring maximum guest satisfaction during their stay. Greeted guests and performed general administrative tasks, filing, scanning and faxing. Responsible charging no-show and cancellation reservation on daily basis. Established and maintained good communications with teamwork and other departments. Trained front desk staff how to provide friendly and efficient service to the guests, taking an active interest in the development of subordinates through training and involvement in innovative thinking. 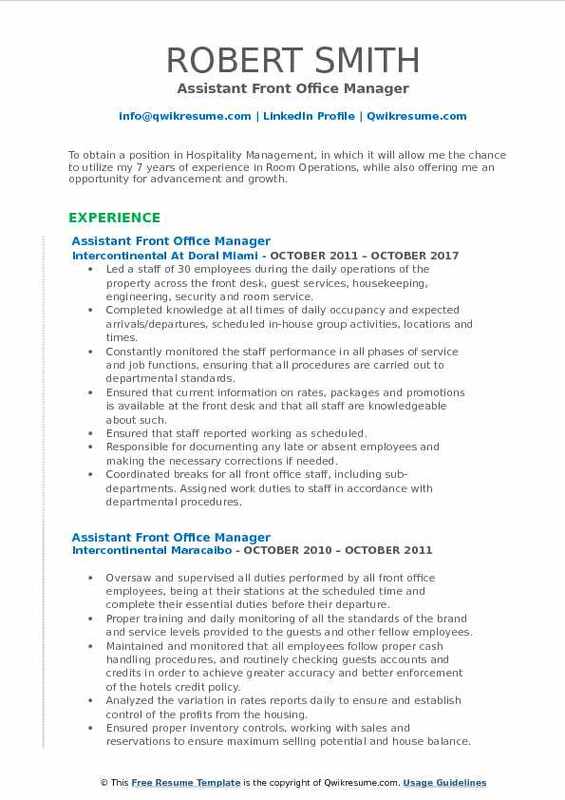 Summary : To obtain a position in Hospitality Management, in which it will allow me the chance to utilize my 7 years of experience in Room Operations, while also offering me an opportunity for advancement and growth. Led a staff of 30 employees during the daily operations of the property across the front desk, guest services, housekeeping, engineering, security and room service. Completed knowledge at all times of daily occupancy and expected arrivals/departures, scheduled in-house group activities, locations and times. Constantly monitored the staff performance in all phases of service and job functions, ensuring that all procedures are carried out to departmental standards. Ensured that current information on rates, packages and promotions is available at the front desk and that all staff are knowledgeable about such. Ensured that staff reported working as scheduled. Responsible for documenting any late or absent employees and making the necessary corrections if needed. Coordinated breaks for all front office staff, including sub-departments. Assigned work duties to staff in accordance with departmental procedures. 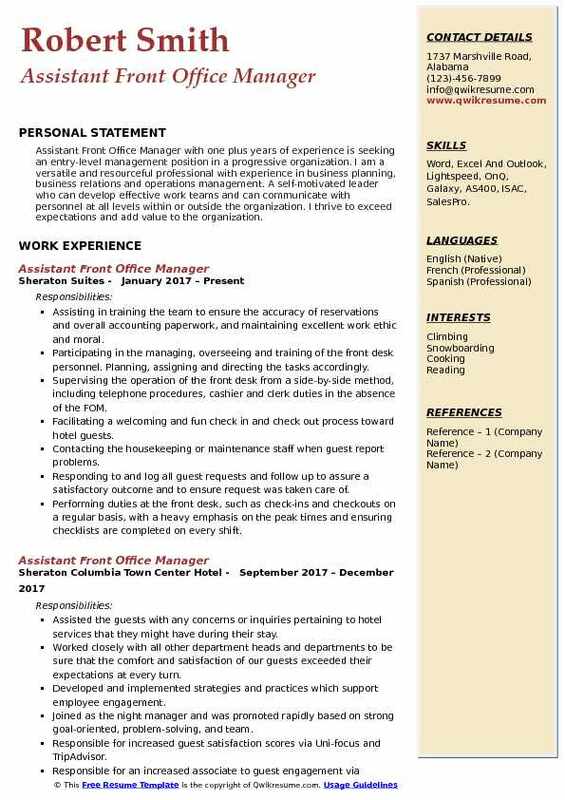 Headline : Experienced Assistant Front Office Manager with 5 plus years of experience in the hospitality industry looking to grow my credentials with a focus on luxury brand service and hotel operations. I wish to obtain a leading role with an organization that shares my vision and passion for customer service and that is invested in my growth and development within the company. Overseeing and supervising the daily procedures of the front desk, concierge, PBX bell/door staff. Training the new hires on company policies and job functions/responsibilities. Offering support, training, counseling, and development of staff under my supervision. Conducting daily pre-shift meetings updating staff on pertinent information for the day/week. Coordinating with other departments in preparation for VIP and group arrivals. Comprising and distributing the bi-monthly updates on departments guest satisfaction scores. Processing and managing the inventory and ordering of all supplies for the front office department. Developing the department incentive program to boost team morale and improving the service scores. Managed and set monthly goals for the departments to upsell program, which resulted in $126,000 in additional revenue. 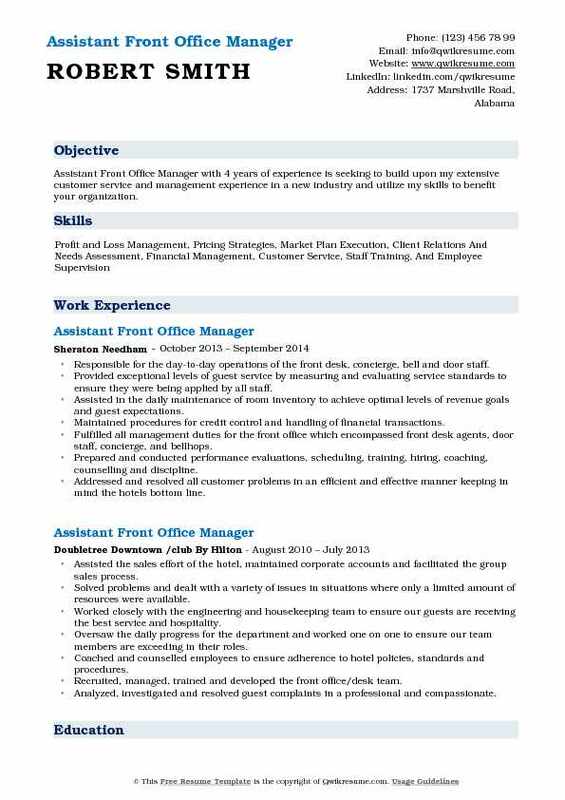 Objective : Assistant Front Office Manager with 4 years of experience is seeking to build upon my extensive customer service and management experience in a new industry and utilize my skills to benefit your organization. Responsible for the day-to-day operations of the front desk, concierge, bell and door staff. Provided exceptional levels of guest service by measuring and evaluating service standards to ensure they were being applied by all staff. Assisted in the daily maintenance of room inventory to achieve optimal levels of revenue goals and guest expectations. Maintained procedures for credit control and handling of financial transactions. Fulfilled all management duties for the front office which encompassed front desk agents, door staff, concierge, and bellhops. Prepared and conducted performance evaluations, scheduling, training, hiring, coaching, counselling and discipline. Addressed and resolved all customer problems in an efficient and effective manner keeping in mind the hotel's bottom line. Responsible for the achievement of departmental objectives and goals. Reported directly to the Front Office Manager and the General Manager. 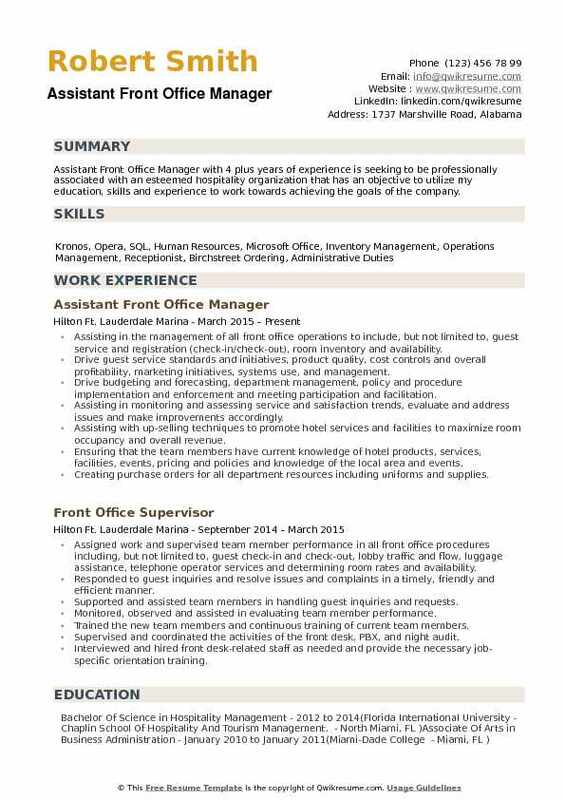 Objective : Assistant Front Office Manager with 3 years of experience. Eager to join a team where I can utilize my excellent interpersonal, analytical and organizational skills. Led and managed a team of 80+, including Associates, Supervisors, and Managers. Standard operating procedure creation, implementation and continuous improvements for the department. Oversaw the brand standard quality controls, and food safety for the front office and executive lounge disciplines. Developed and managed the front office budget including labor expenses and operational spending. Piloted the uni-focus program to enhance scheduling and labor management to maximize productivity for the department. Maximized revenues by managing overselling, setting up price consistency and implementing upselling strategies. Managed emergency situations during evacuations, medical emergencies, and severe weather emergencies. Monitored the check-in/check-out process, ensuring agreement to hotel standards, anticipate critical situations and assist wherever necessary to help alleviate the pressure and to process the guest expediently. Summary : Assistant Front Office Manager III with 20 plus years of experience is seeking to obtain a position with a great company where I can utilize my strong communication skills, exceptional customer service and organizational skills. Overseeing 25 employees within four separate departments to ensure the successful implementation of all key operations, policies, and standards. Developing and conducting presentations to the staff and other management concerning policy and procedure changes, financials, and means for improvement in all areas. Daily, monthly, and yearly evaluations of over twenty administrative, financial, and operational reports and interpreting those results to maximize guest satisfaction and operating income. Responsible for new hire training and hiring, payroll for 4 departments, and staff development. Continually improving guest satisfaction and maximizing the financial performance of the department. Successfully aided in the conversion and training of a new property management system. Successfully worked with the sales team to land multiple airline accounts, developed a system for accurate transportation scheduling, group accounting, and incentive-based rewards for the accounts. Promoted into management: lead a team of 25 among 4 departments within a 772 room hotel. Objective : Assistant Front Office Manager with one plus years of experience is seeking an entry-level management position in a progressive organization. I am a versatile and resourceful professional with experience in business planning, business relations and operations management. A self-motivated leader who can develop effective work teams and can communicate with personnel at all levels within or outside the organization. I thrive to exceed expectations and add value to the organization. 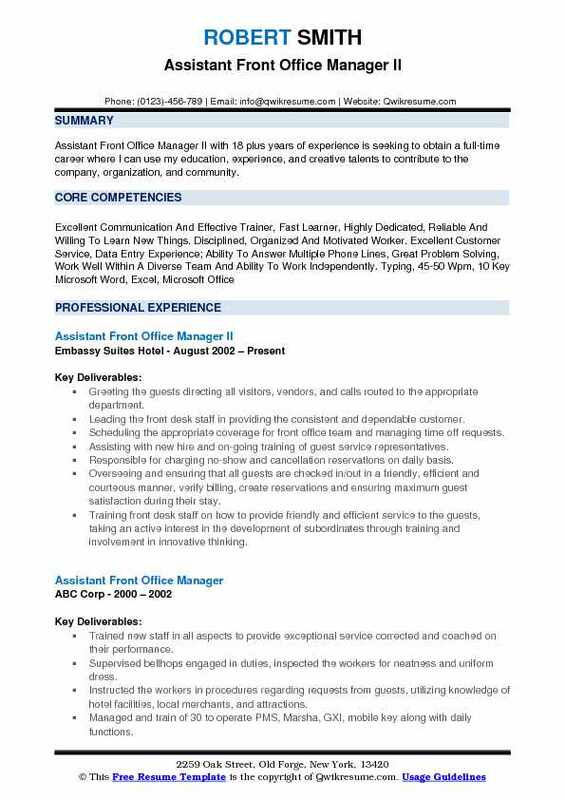 Skills : Word, Excel And Outlook, Lightspeed, OnQ, Galaxy, AS400, ISAC, SalesPro. Assisting in training the team to ensure the accuracy of reservations and overall accounting paperwork, and maintaining excellent work ethic and moral. Participating in the managing, overseeing and training of the front desk personnel. Planning, assigning and directing the tasks accordingly. Supervising the operation of the front desk from a side-by-side method, including telephone procedures, cashier and clerk duties in the absence of the FOM. Facilitating a welcoming and fun check in and check out process toward hotel guests. Contacting the housekeeping or maintenance staff when guest report problems. Responding to and log all guest requests and follow up to assure a satisfactory outcome and to ensure request was taken care of. Performing duties at the front desk, such as check-ins and checkouts on a regular basis, with a heavy emphasis on the peak times and ensuring checklists are completed on every shift. 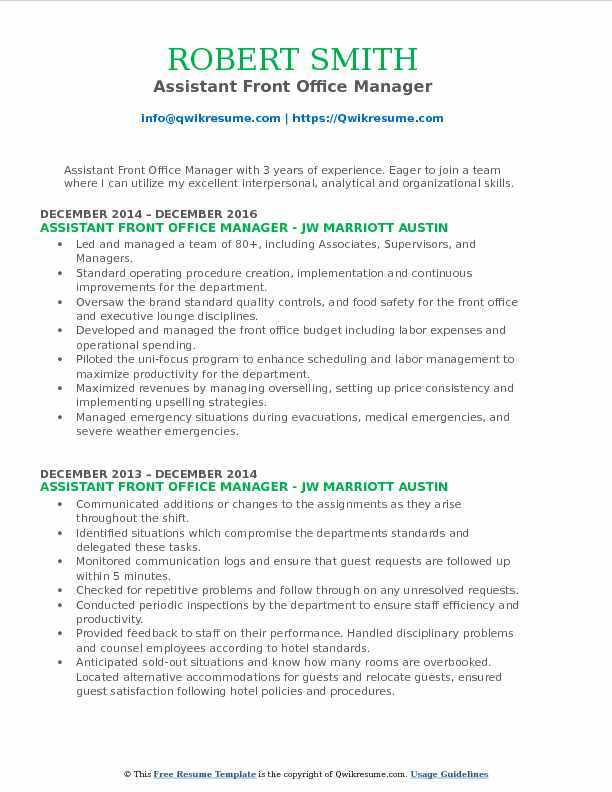 Objective : Assistant Front Office Manager with 4 plus years of experience is seeking to be professionally associated with an esteemed hospitality organization that has an objective to utilize my education, skills and experience to work towards achieving the goals of the company. Assisting in the management of all front office operations to include, but not limited to, guest service and registration (check-in/check-out), room inventory and availability. Drive guest service standards and initiatives, product quality, cost controls and overall profitability, marketing initiatives, systems use, and management. Drive budgeting and forecasting, department management, policy and procedure implementation and enforcement and meeting participation and facilitation. Assisting in monitoring and assessing service and satisfaction trends, evaluate and address issues and make improvements accordingly. Assisting with up-selling techniques to promote hotel services and facilities to maximize room occupancy and overall revenue. Ensuring that the team members have current knowledge of hotel products, services, facilities, events, pricing and policies and knowledge of the local area and events. Creating purchase orders for all department resources including uniforms and supplies. Conducting the monthly front office meetings and team member engagement outings.